Exploring a variety of locations and experiences, the poems in Ticket Home tap into our universal desire to feel ‘at home’. Some have autobiographical starting points, others have a clear base in specific places, while Powell’s careful observations transform ordinary events into the extraordinary. We are compelled by her particular blend of rich imagination and sharpened imagery to journey with her . . . perhaps to seek our own tickets home. 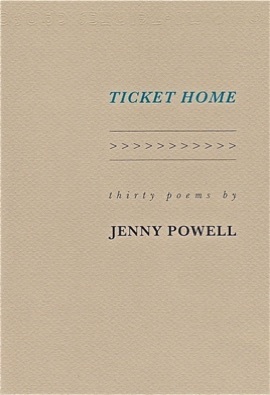 Jenny Powell is an established New Zealand poet with four previous individual and two collaborative collections of poems, most recently Locating the Madonna (with Anna Jackson, Seraph Press, 2004) and Viet Nam: A Poem Journey (HeadworX, 2010). Her work is published in national and international literary magazines. She has been a finalist in the UK 2008 and 2009 Aesthetica Creative Arts Competition, runner up in the 2010 UK Mslexia Poetry Competition and a finalist in the 2011 Wales Poetry Competition. She lives in Dunedin.